Benson Saulo has achieved an incredible number of things in his 27 years. He’s represented the youth of his country at the United Nations, and sat across the table from world leaders discussing youth issues. He’s addressed the United Nations General Assembly and started several ambitious Indigenous youth initiatives. He’s toured the country, conducting workshops and engaging with countless young Indigenous people. He’s a gifted orator, a superlative role model, and widely regarded as one of the brightest young Indigenous leaders in the country, with a career in politics now beckoning. 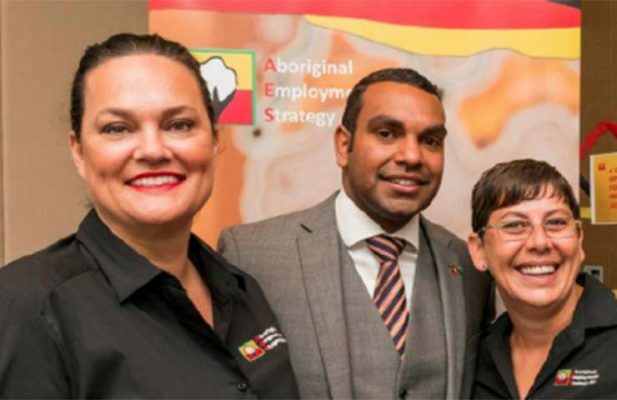 Among all of these incredible achievements, Benson says that it’s his involvement with an Aboriginal Employment Strategy (AES) traineeship, which he began as a 15 year-old at the ANZ Bank, that ranks as one of the proudest and most impactful experiences of his life so far. Benson was one of the very first Aboriginal students to become an ANZ school based trainee, a successful program supported by the AES that provides Indigenous students with training and career pathways in banking. By the second year of his traineeship, Benson had decided that a career in banking was something he’d like to pursue. He worked at ANZ from the age of 15 to 22, beginning as a bank teller before progressing to other positions, including International Officer and Business Bank Manager. After relocating from Tamworth to Sydney he worked as an Assistant Business Banker and was the only Aboriginal person working at the ANZ Head Office at the time. In 2009, Benson began working as a Business Analyst with the ANZ’s Indigenous Employment and Training team. Benson had been the third ANZ Indigenous School based trainee overall, and seven years later, over 500 students have become involved in the program. The experience, know-how, and confidence Benson gained over these years at the ANZ played a big role in his decision to apply to become the Australian Youth Representative to the United Nations, and in 2011, he was selected from a pool of 300 other applicants, becoming the first Aboriginal person to be appointed to the position since its inception in 1999. Benson believes that his work experience at ANZ played a critical role in his successful application. “I had seven years of experience working in the finance industry, my ability to work across Government and corporate organisations, to manage different relationships, and also to advocate for particular issues put me in really good stead for working at the United Nations,” says Benson. As part of his role, Benson spent three months living in New York as a certified member of the Department of Foreign Affairs and Trade. During his time in New York he presented to the 66th Session of the United Nations Assembly the views and concerns of the young Australians he’d spoken with during a six month tour of the country. He also worked as a negotiator on two UN resolutions concerning young people. He describes the experience as one that will impact him for the rest of his life, and also one that has fuelled his ambition to continue working in a capacity to advocate for the rights and advancement of Aboriginal and Torres Strait Islander people. After returning from the UN, Benson established his own Indigenous youth focused initiative, the National Indigenous Youth Leadership Academy (NIYLA). In 2012, the initiative began engaging with Indigenous youth from around the country, and by 2014, had built an alumni of 100 individuals and launched 10 youth led social action campaigns on issues such as suicide prevention, mental health, and climate change. More recently, Benson has co-established an initiative called ‘The Man Cave’ that seeks to address and engage with issues of domestic violence and the mental health of young Aboriginal males. Having already achieved so much in just 10 years, Benson now has ambitions for a future role in parliament and a career in politics. Reflecting on his journey so far, Benson emphasises the importance of having the courage to take a positive first step towards employment and a career. Coming from a country town, opportunities can often seem limited, but Benson’s achievements show that with the right support, a single opportunity can lead to some amazing outcomes. “You never know what people are capable of, and sometimes people just need an opportunity or an open door, or and open hand to help them up, and the beautiful thing the AES provided me with was that firm stepping stone to take that next step in my life,” says Benson.